Well, we are back in Dallas and trying to remember what real life is like after a short but incredible first getaway as a family of three (humans - no disrespect to Little Child)! July 4 weekend is always a big one for us since we celebrate my birthday the day before. This year was even more memorable as we needed to head down to San Antonio to finalize Heidi's adoption around her six month birthday. 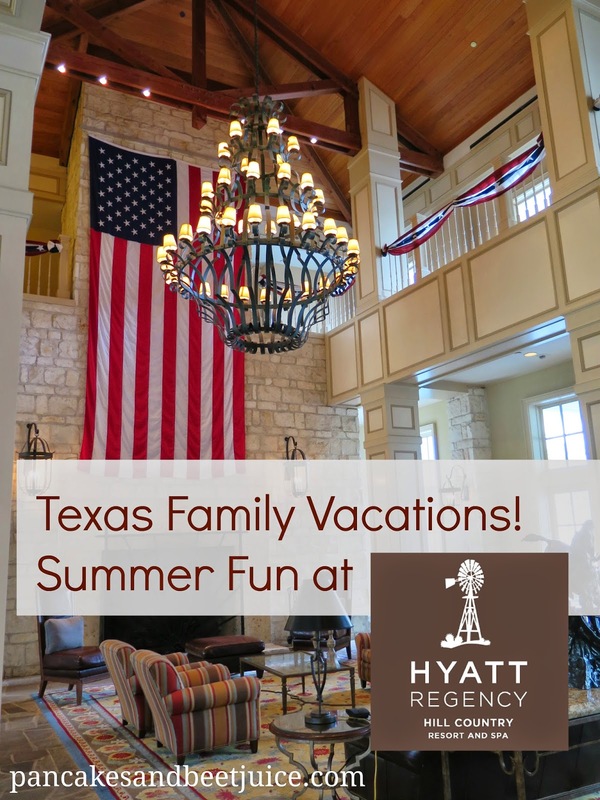 We decided to really celebrate everything at once and spend the weekend putting Heidi's adoption in ink, celebrating my birthday and spending a happy July Fourth all at my favorite Texas resort, The Hyatt Regency Hill Country Resort and Spa. With so many big milestones for us in one weekend, I was a little nervous that our expectations could be a little high. They were nothing but exceeded during our magical long weekend here! I am so excited to share some of our pictures and what's made this place a family favorite of ours and our friends for nearly twenty years. Formerly a Hill Country cattle ranch, the resort grounds are always gorgeous and the perfect mix of simple and Texas majestic. This was my fourth trip to the resort, and it always looks just as you left it but never in need of updating. They do such a great job of keeping it new and nostalgic at the same time. The patriotic decorations for the Fourth were such a gorgeous touch. Do not miss the opportunity to sit on the big back porch off the lobby a few times a day and just take in all of the families having fun on the great lawn and in the pool! We watched a lot of flag football from here while enjoying coffee and iced tea. We had a King bed first floor walk out room, and it was perfect for our family. Lots of extra space for a crib and baby gear inside, and a wonderful sliding french door that went straight out to the activity outside. This was the perfect way to handle baby feedings and nap time without ever feeling cooped up in our hotel room. Heidi had her bottles and meals outside, and during her nap time I would sit out on our spot and read with the door cracked open. She managed to stay on schedule (for the most part), and Markus and I didn't have to miss an ounce of sunshine. I am definitely putting in a request for a walk out room for our future trips! My only hesitation when booking our trip was when I wondered if Markus and I would have enough healthy-ish and gluten free dining options for staying on site for a few days. Once I arrived and we looked at a few of the menus, I could not believe the thought had ever crossed my mind! This is some of the best gluten-free options we've ever had on vacation, and the food was exceptionally fresh with an emphasis on local ingredients. There are multiple restaurants on site for lots of variety. Since we stayed pretty casual with the bebe in tow, we were mostly in the casual dining spots. I remembered the big breakfast buffet at Springhouse from when I was younger. Markus went without me one morning and I quickly learned that it has definitely been revamped from my previous trips, where I remembered mostly waffles (or maybe my taste buds had just grown up). If Markus is raving about a breakfast, you know it is something special! Sure enough, I was super impressed the next morning to see cage free eggs, sprawling fruit options, omelette and waffle stations and some of the best steel cut oats I've ever had. On the Fourth there was even a free mimosa and Bloody Mary bar for the grown ups! Can I get a God Bless America? Delicious gluten free blueberry muffins on the breakfast buffet! For snacks and meals on the go, there's also The General Store. They have delicious breakfast tacos in the morning, Blue Bell ice cream by the scoop, Starbucks coffee drinks and a big assortment of pre-made salads and gluten free snacks! Even the pool snacks were a cut above! Markus loved this grilled chicken salad and I got into the summer spirit with a poolside burger on a gluten free bun. The proof is in the pudding on how much care goes into their recipes and ingredients when you stroll past the Chef's Herb Garden on site. It was no surprise that my favorite spot on the resort was the gorgeous Windflower Spa. It's by far one of the best hotel spas I've ever visited, and one of the premier spas in the San Antonio area. I kicked off my birthday with a 60 minute Therapeutic massage with John that was magical. Moms - make sure you get over here during your stay! There are lots of spa services to choose from or you can purchase a day pass to the amenities and enjoy the heated lap pool, lounge areas, indoor and outdoor jacuzzis, steam room, dry sauna and showers. Markus was nice enough to watch Heidi during nap time more than once so I could dip in this gorgeous tub and meditate in the eucalyptus steam room. The cucumber water and chilled facial towels were perfect after hours in the sun. I really loved how the decor was a perfect mix of clean, spa lines and personal, B&B style touches. It had so much personality while being so Zen at the same time. There's so many fun things to do at the Hyatt, the only question was what would fit into our weekend! The great lawn behind the main building was always buzzing with flag football, soccer, cookouts and an outdoor movie every night. Movie nights on the lawn! Bike rentals are available for all ages, and there is a Flow Rider surfing spot for the adventure kids (aka Markus). Rowdy and Stella are the resort rescue dogs, and there are fun activities for families here throughout the day. Lots of arts and crafts opportunities that make for fun mementos! Heidi loves the pool so we knew she would be happy here! Since she is so small, we took her into the adult pool area with us for some lounging. The waterfall surround really blocks the outside noise of the rest of the resort and makes an oasis. We loved our poolside snacking and napping here. It was heated to a perfect temperature of 82 degrees during our stay and has its own hot tub. The family pool was a blast with lots of kids and water games. Little girls swimming loved making a fuss over Heidi. And of course there is the Ramblin River, a lazy river that slinks around the property and is always filled with tubes and people enjoying the water. Some special July Fourth activities included family Bingo, food trucks, bike decorating, a parade and of course, fireworks! It was such a special way to celebrate! Getting in the parade action from our walk out! Our family chose and reserved our stay at the Hyatt Regency Hill Country Resort independently. Parts of our stay were generously gifted by the Hyatt. All opinions stated in this post are 100% authentic and our own. So cute, Lilly. So glad you had a great time. Then again, that gorgeous little girl of yours would have a wonderful time anywhere as long as she was with her Mommy and Daddy. I think you should send your post to Hyatt... your family is the perfect advertisement for them. Have a great week! sounds like a wonderful vacation for you guys!! Looks awesome! We are going to have to check it out! What a great place! Pinning this for future vaycay destinations. Happy birthday and happy adoption signing day! So happy and proud for you guys. This is a mind boggling travel blog! You should do a ton more. I would love to know where you and your family savor the information of going as uncovering spots for our kids who are 8 and 15 is incomprehensibly hard. Such unique levels of progress, you know? Truly revere this kind of thing. Hi Lilly. Such an adorable kid. Wonderful shots! You’re really talented photographer.